Talin contains a 47-kDa N-terminal head, a neck and a 220kDa rod domain. The head domain comprises four subdomains termed F0, F1, F2 and F3, with the latter three forming a three-lobed FERM domain. This schematic diagram illustrates the molecular organization of talin (reviewed in [6, 7, 18]) and shows how talin is represented throughout this resource. Hypothetical dimer complexes are presented . ABD = actin binding domain, IBS2 = integrin binding site 2, PIP2 = phosphatidylinositol-4,5-bisphosphate, FAK = focal adhesion kinase, PIPK = phosphatidylinositol phosphate type 1γ. Integrin tail binding occurs via the F3 phosphotyrosine binding (PTB) domain via a unique interaction with the integrin membrane proximal region, which is sufficient for integrin activation . The basic patches on all subdomains can dock onto the plasma membrane and further enhance integrin activation. Specific interactions through basic residues on F3 are also essential for integrin clustering . Both F2 and F3 contribute to actin binding, with the F3 binding pocket being the same that binds integrin and PIPKIγ90 as well thus linking these adhesion components . F3 also binds to layilin (a hyaluronan receptor) and signaling molecules FAK (reviewed in ). The neck region is susceptible to cleavage by calpain 2 . The rod contains an additional integrin-binding site (IBS2), two actin-binding sites (ABD) and several vinculin-binding sites that are shown to be exposed by stretch in response to force, both in vitro  and in vivo . Vinculin binding reinforces and increases the stability of adhesion sites . Talin also contains numerous potential phosphorylation sites  which are suggested to directly or indirectly regulate the association of talin with other factors (reviewed in ). Talin recruitment to membrane. Ligand occupancy in certain cell-surface receptors (agonists) causes phospholipid hydrolysis releasing diacylglycerol (DAG) and inositol triphosphate (IP3). IP3 increases cytosolic levels of calcium ions; DAG and Ca2+ can promote GTP-loading and membrane translocation of Rap1 either by activating Ca2+ and DAG-regulated GEF (CALDAG-GEF or Rap-GEF) or protein kinase C (PKC). Activated Rap1 in turn, recruits Rap1-GTP-interacting adaptor molecule (RIAM) along with its binding partner, talin to the plasma membrane. Adapted from [18573917, 20308986]. Talin exists in an autoinhibited form in the cytosol due to the intermolecular association between the F3 subdomain and a helical bundle in the rod region . This not only blocks integrin binding site on F3 but also F2 and F3 binding to membrane. Activation predominantly occurs inside FAs  and likely involves binding to membrane phospholipids such as phosphatidylinositol 4,5-bis-phosphate (PIP2)  (reviewed in ), vinculin and F-actin  or calpain cleavage . 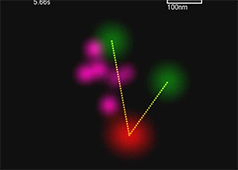 This enhances talin’s affinity for the β-integrin subunit by revealing binding sites. 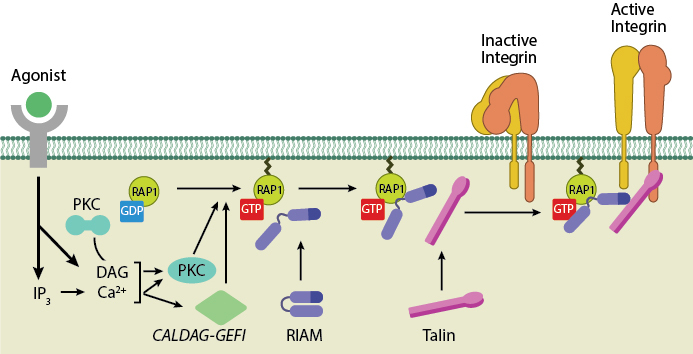 Agonist stimulation has been shown to trigger a signaling pathway for membrane targeting of talin/ activation of integrin αIIbβ3 , involving small GTPase Rap1, Rap-GEF or protein kinase C and adaptor protein RIAM . Talin is abundant specifically at sites of cell-ECM linkage  where it appears to be a key endpoint for multiple signaling pathways that lead to integrin activation (reviewed in ). Talin behaves as a prominent structural platform that is required for the initial linkage between the contractile cytoskeleton and sites of integrin/fibronectin adhesion . 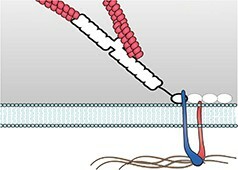 During cell spreading, talin undergoes cycles of stretching and vinculin binding due to contractile forces on the rearward moving actin filaments . This phenomenon serves to convert matrix forces into biochemical signals at the adhesion site. Hence it not only organizes and stabilizes these initial linkages , but it also mediates signal transduction events through the integrins, vinculin and actin (reviewed in ). 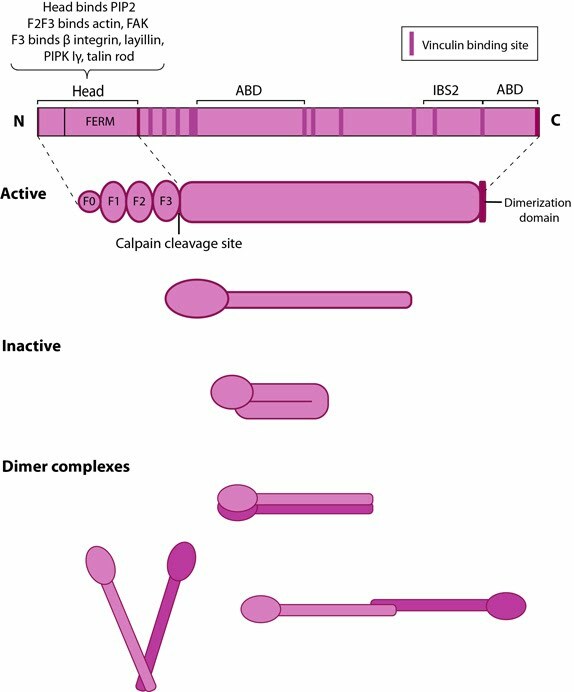 The proteolytic cleavage of talin has been shown to be a critical event in the subsequent disassembly of other focal adhesion components  but not in integrin activation. Although talin is a key factor that translates mechanical forces into chemical responses primarily at sites of cell-matrix and cell-cell junctions, talin may also function in other cellular processes including membrane ruffling, cytokinesis, and phagocytosis (reviewed in ).